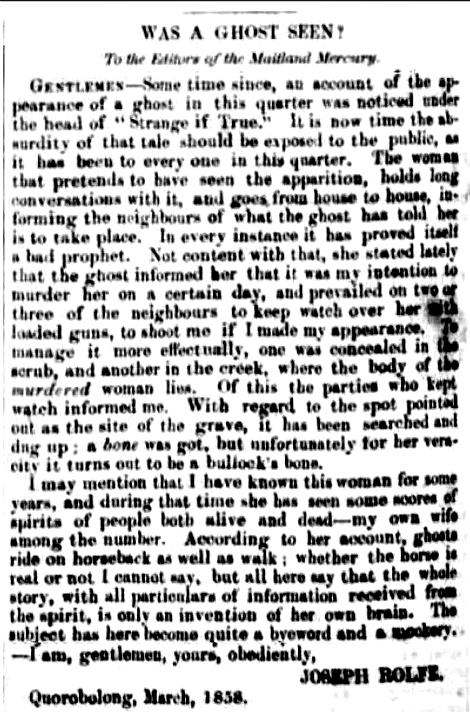 By Jon Wyatt - Did the spirit of a missing person provide testimony from the grave about her murder near Wollombi, NSW, Australia, in 1857? The Hunter Valley 142 kms (89 mi) N of Sydney is an historic and picturesque region, but it's also flood prone. In August 1857 a record flood devastated the district and when roads eventually reopened news of the Wollombi ghost haunting reached Maitland, 56 kms (35 mi) NE of Wollombi, and from there the wider world. The materialisation allegedly occurred on a grand agricultural estate several miles NE of the village of Wollombi. 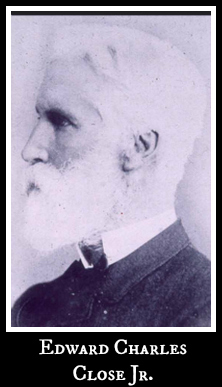 The (now defunct) 'Quorrobolong Estate' of 4,520 acres was owned at the time by the well-connected Edward Charles Close Jnr (1825-1887). The property, among other things, produced fine wine and thoroughbred horses. Mr Close purchased it in 1853 however the land grant titles dated to the 1830's and 1840's when convicts were assigned to work there. The ghost seer Mrs Laskett an unassisted immigrant who'd arrived in the country in recent times, lived in a former convict hut near the Sandy Creek. “Frequently, Mrs Laskett imagined that she saw a something which she could not describe, apparently playing at hide and seek among the trees, and then around the hut, but, having no belief in ghosts, she put it down as an optical illusion. Within the last six months, however, this mysterious something assumed a more natural form. At first, it appeared like a bundle of woman's clothes suspended in the air, and used to delight in hovering over the water-hole in the creek, a little distance from Mrs Laskett's hut; but the momentary fear and trepidation which was occasioned by this apparition having subsided, nothing more was thought of it. “At last the woman's clothes, when next seen, were on an apparently aged female; her face was pale and wan, and miserable to look upon. Lifting up one of her hands, she beckoned Mrs Laskett to follow her; but flesh and blood could not stand the fright, and the poor woman had fainted. Night after night the ghostly visitor appeared, but fright prevented Mrs Laskett from obeying her injunction. At length, she determined upon the next visit to muster up courage enough to address the ghost, and ask her why she continued to haunt her. “Mrs Laskett followed, and was taken down to the water-hole over which she had often seen the strange sights. The ghost was silent until arriving at the hole, when, turning round, she said, 'My body is there,' and disappeared. Since then Mrs Laskett had not been troubled by the visitor. Not knowing what to think of this apparition and discovery, she decided upon taking the advice of her neighbours. “This story created some excitement, and this excitement was increased when, upon searching the records of the Wollombi Police Court, it was discovered that a woman named _______ had resided in that hut, and she had disappeared in a most mysterious manner. A private inquiry, we are told, was held, and Mrs Laskett was questioned and cross-questioned, but her story was in no way shaken. They were unable, however, to test the truth, by searching for the supposed body in the water-hole, in consequence of the quantity of water at present in it, but intend, we believe, doing so when it subsides. We are also told that the person who was named as the murderer is still residing in the district. The medical man determined the bone was from a bovine and the police, suspecting the surging flood waters had destroyed the supposed grave, discontinued the investigation and the story faded from history--interestingly if Mrs Laskett's story were true, the materialisation of the spirit of aged woman to reveal the grave before it was washed away, was, in effect, a flood prediction). There is a final twist to this story. “The woman that pretends to have seen the apparition, holds long conversations with it, and goes from house to house, informing the neighbours of what the ghost has told her is to take place. In every instance it has proved itself a bad prophet... not content with that, she stated lately that the ghost informed her that it was my intention to murder her on a certain day, and prevailed on two or three of the neighbours to keep watch over her with loaded guns, to shoot me if I made an appearance... Of this the parties who kept watch informed me. “With regard to the spot pointed out as the site of the grave, it has been searched and dug up; a bone was got, but unfortunately for her veracity it turns out to be a bullock's bone. If the whole story was an invention, we may well ask, why did the Wollombi police bother to fully investigate the case; and if the woman was a troublemaker, why wasn't she fired long ago? Why was Mrs Laskett so fearful of Rolfe? Was he the person who was named as the murderer?